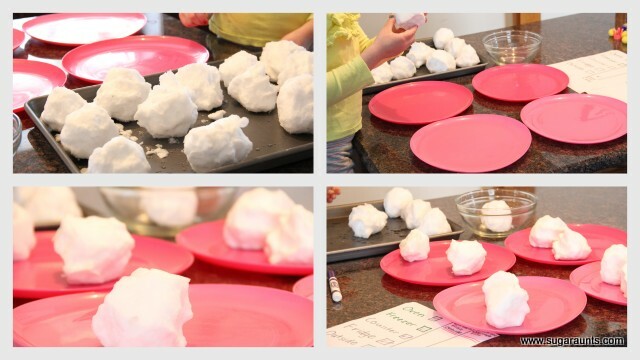 We thought it would be fun to try putting the snowballs in different places and seeing which would melt faster. Big Sister guessed that the snowball we put outside would melt first, because it was a sunny day that afternoon, and she thought the sun would melt the snowball. We put some snowballs on plates and put a plate outside, in the freezer, in the refrigerator, in the oven (turned on), and left one plate on the counter. We didn't have a melted fridge snowball until the next morning. Big Sister ranked them on her sheet in order of melting. And of course had to eat the ice that the outside-melted snowball turned into after a really cold night.